A week on from the Australian Masters, it was another case of going, going John as John Daly crashed out of the Australian PGA Championship. Daly, clearly a crowd favourite, received the biggest cheer when his name was announced at the first hole along with playing partners, Geoff Ogilvy and Michael Sim. Unfortunately for Daly, he made a poor start and was 3 over after the first 3 holes. On the final hole, needing at least a par or birdie to make the cut, Daly pulled out his driver and went for it, only consign his ball, and his chances, to a watery grave. Instead of repeating his performance in 2002 when he threw his putter in the lake beside the 18th green, Daly put his putter in his golf bag after putting out and walked off. In a show of appreciation, the gallery around the 18th green gave Daly generous applause. Newly promoted Nationwide Tour player, Jarrod Lyle scored a course record-equalling 63 to put him at joint top of the leader board at nine under with US PGA Tour player, Mathew Goggin, who scored a 68. After having completed his first round early in the morning on day 2, Lyle then went back out on the course to start his charge. In his second round, Lyle kick-started his charge with successive birdies at 12 and 13 and 16 and 17, before picking up further shots at the 2nd and then four in a row from the 5th to almost break the course record. Lyle partly attributed his good round to a stern talking to by his father. “It’s been kind of weird my golf game, I’ve been playing good but just not scoring and just not taking advantage of the easy holes,” said Lyle. “I sat down with Dad last night over dinner and pretty much had an argument with him about everything that I’m doing.” “Something kind of snapped in me and today was just one of those days that I hit it really good. I hit it just as good as yesterday but holed some putts and got some momentum going.” Goggin acknowledged the slow start his day which started when he had to complete round 1 after it had been suspended the prior afternoon due to an impending storm. “I didn’t do much through the really still part of the day, but it’s a tricky little golf course and now with the wind up in the afternoon nine under will probably be around about at the end of the day,” Goggin said. Former US Open champion, Geoff Ogilvie, spun his wheels for much of his round but finished by sinking a six-metre birdie putt on the 18th for a 71 and to end day 2 at T10 but only three strokes behind the leaders. Aside from Daly, another major casualty was defending champion Peter Lonard who missed the cut at the event for the first time in his career. 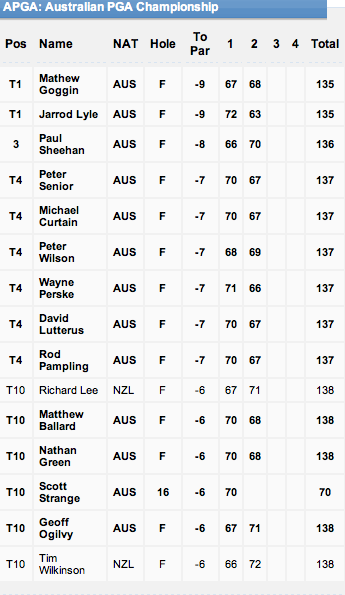 Australian Masters champion, Rod Pampling, put himself in a good position for moving day with a five under 67, to be T4 with five others. With another late afternoon thunderstorm forecast, moving day promises to be a fascinating test of golf. Who will emerge from the pack as a front-runner for the title? Be sure to log on to THP to find out. I would like to see Jarrod do well on the PGA this year… he is a pretty likeable guy.